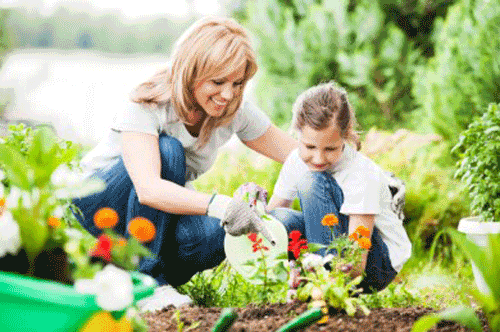 Gardening with children especially grand-children can be a wonderful and rich bonding experience. 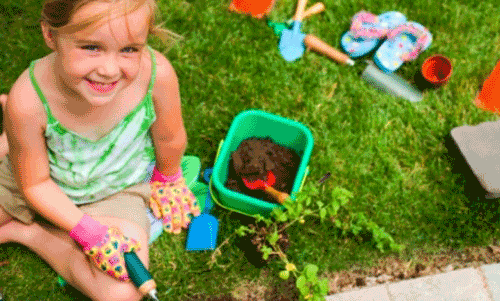 The older ones can pass along their wisdom and gardening knowledge and the younger ones can have fun playing in the dirt, learning new things and hanging out with their favorite grandparents. We have all read the studies that say being outdoors for young and old can be healthy. You get the added Vitamin D from the sun, and you can reduce stress and anxiety by just getting away from the TV and computers. And, don�t forget to leave the cell phone on the charger indoors. This is not the time to be interrupted. Plan on making this time spent with your grandchildren fun and not a chore that they won't like. Playing in dirt with pottery & tools is suppose to be fun not laboring. 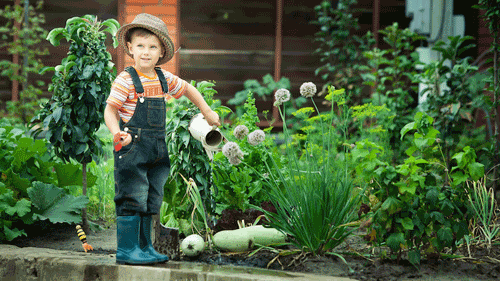 Having a child start with seeds or seedling by planting it themselves, then watching it grow into something that is beautiful they can look at, or yummy that they can eat will teach confidence and skills of accomplishments. The best place to start is at the beginning when deciding what to grow and plant. If they are involved in the planning stage they will be more likely to stick with the process through harvesting. Let them have their own plants or veggies and make them responsible for them. A good place to go is online or to a book store. Even Home Depot can be a learning process and a lot of fun. Let them select small size garden pots so their hands can hold them. Work with simple pot designs that they can paint or decorate. Different soil, diseases that can happen, bugs that are beneficial and get them their own kid sized garden tools, gloves, buckets, and planter pots. Plant herbs, flowers, veggies and fruits. There are many species that are easy for your particular area and those are best ones to start with. Ask for advise from the local nursery if unsure. Now is the time to nurture them, teach them and have fun with them. You may not get a second chance! Read more.....A no fuss garden planter. Read more.....Cluster your garden containers.